Yeah...it's spring and finally nice enough for me to get on outside and back to one of my favorite things to do...paint furniture!!! If you have been following me you may remember this poor old beat up 1940's desk I had in the garage. I actually bought it two years ago for $20 while I was out hitting yard sales with my sister. Here it is after I pulled it out of the garage to take a really good look at it! Ugh...was all I thought...this thing was going to need A LOT of work along with some major TLC!!! I wondered whether or not I was biting off more than I could chew!!! I was definitely going to have to sand down the top because of all the scratches on it. 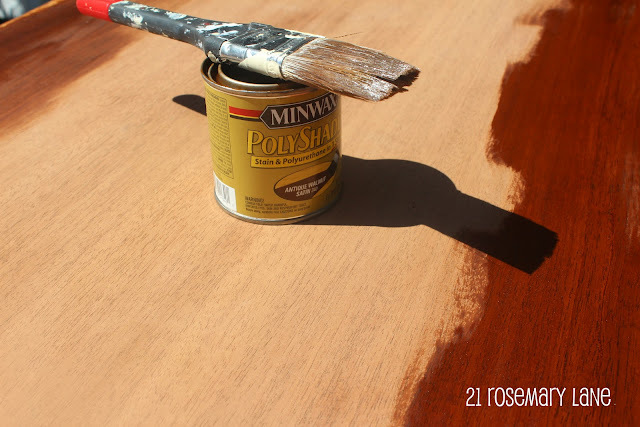 I really wanted the top surface to be a natural color, so after sanding it I applied 3 coats of Minwax's Poly Shades in an Antique Walnut satin finish to both stain and wax the desk top. O.K. I was good so far...but was my freshly made chalk paint going to be able to pull off the look I wanted? 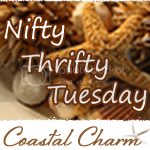 I purchased a gallon of Antique White interior paint in a flat finish from Walmart for about $11. Then I made the chalk paint by adding calcium carbonate...the recipe I used is from Sherry from over at the beautiful blog No Minimalist Here and you can get the recipe plus my take on it by clicking here. I had to paint 3 coats on to get the desired coverage on my desk. 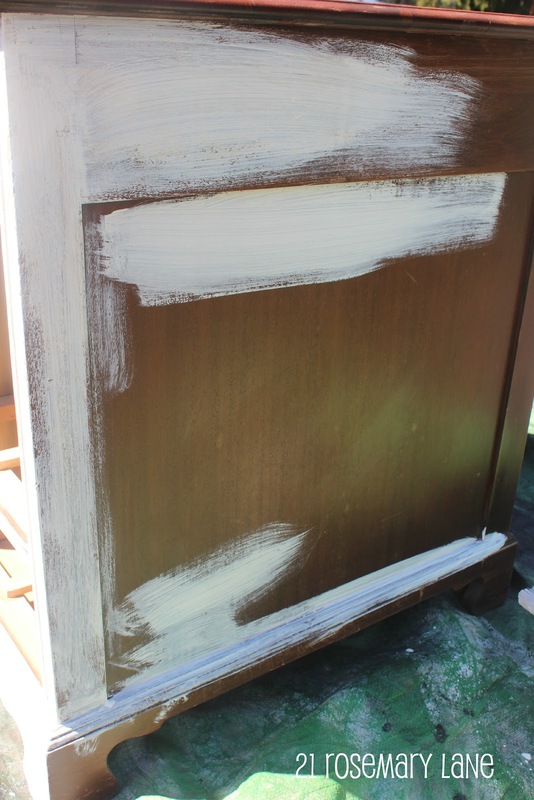 ...so after I painted the drawers I brushed on some of the same Minwax and then wiped it off leaving just a hint of color. This desk is slated to be part of the new office room makeover. 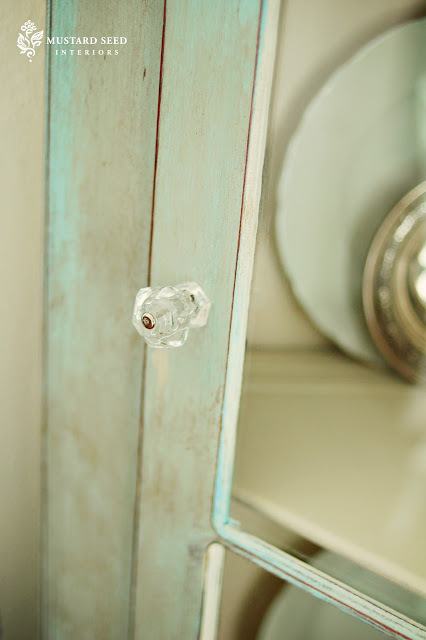 Total cost in materials to redo this piece was roughly $10, and I still have plenty of the chalk paint left for another project! If you like this post please vote for me by clicking on the button below. Barbara, it turned out great! I love how you left the top w wood tone. Happy Easter! I hope your Easter was meaningful. Oh my gosh! That turned out really great! 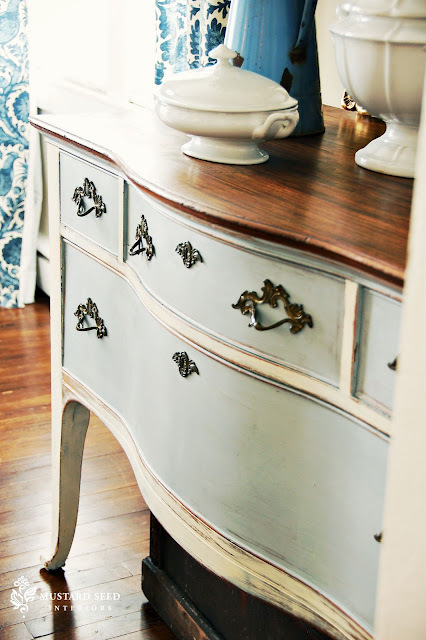 I haven't tried chalk paint yet...but I have this buffet in the corner...just starin at me. Thanks for the inspiration! Wow! That turned out beautiful! Amazing work, I love it! Like night and day my dear! The colors are wonderful and the top looks better than new! Great job! 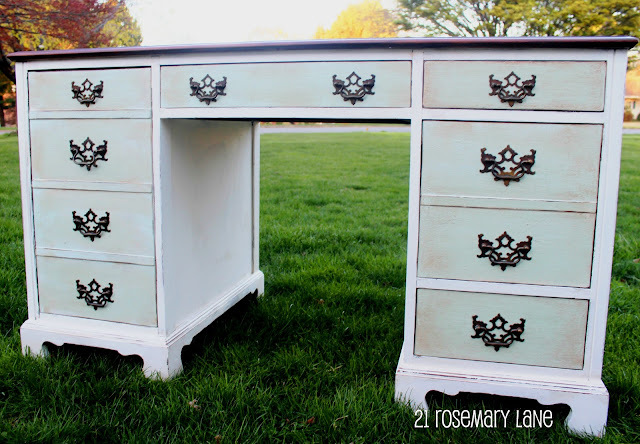 This is such aa awesome restyle I love the color :) I have a desk that I want to paint you've given me an idea or two. 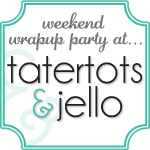 I'm your newest follower stop by for a blog visit. That is so beautiful! Great paint job and an amazing transformation! It's awesome. I love it! Your desk is absolutely beautiful now! 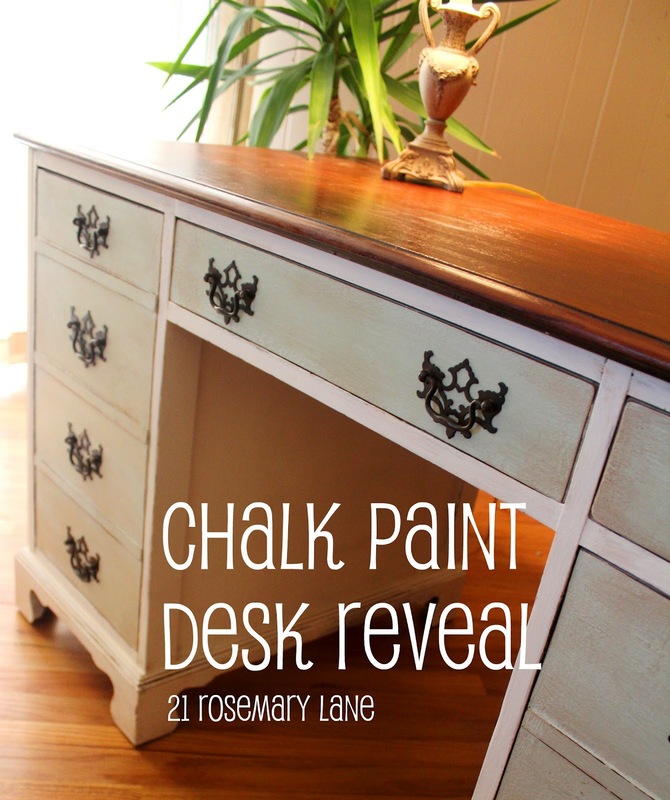 I am going back to read your post about your chalk paint formula. I have made some with plaster of paris and it was successful. But I've read that using the calcium carbonate was better. Wow your desk came out incredibly beautiful. Love the lines and it has such great drawer for storage. I've always loved the top being left natural wood. Looks fabulous! I have to try making mine own chalk paint! Bravo Barbara I adore the transformation of this desk!! The contrast is wonderful!! I hope you will come and see my New ASCP projects! This is beautiful work. It is so soft and feminine. It asks for someone to sit and write! Love it! Barbara thank you so much for sending me the link! Your desk turned out just beautifully. I love the color you chose! Great job! I love it, and I now know how to make my own chalk paint...fabulous! Beautiful desk and for $20? WOW! 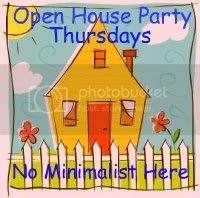 I would love for you to come link up at my Creative Inspirations party happening NOW! I would love to have you there! You nailed Miss Mustard Seed's look! What an amazing transformation. I love the colors. Great job! I'm visiting from Redoux. 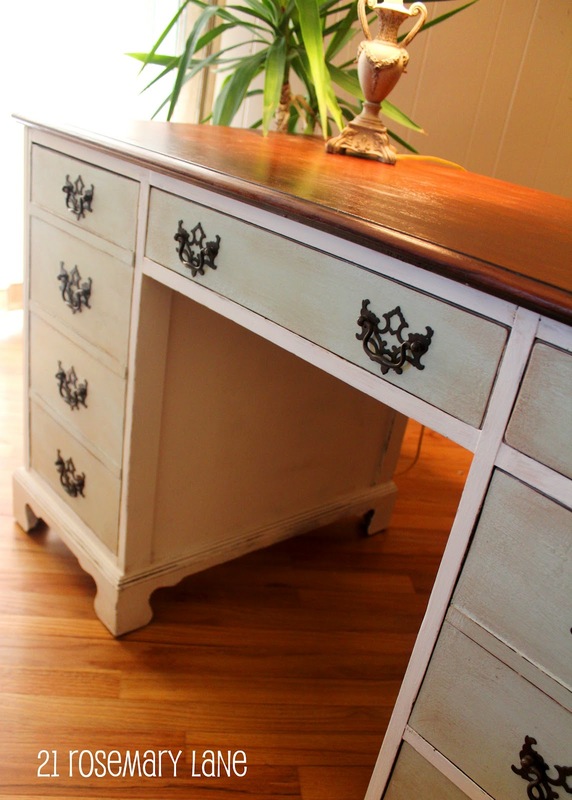 Love this desk, it turned out beautifully. 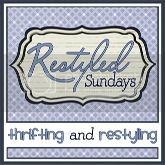 Come check out where I featured it on this weeks Restyled Sundays. Oh wow, she's a beauty! 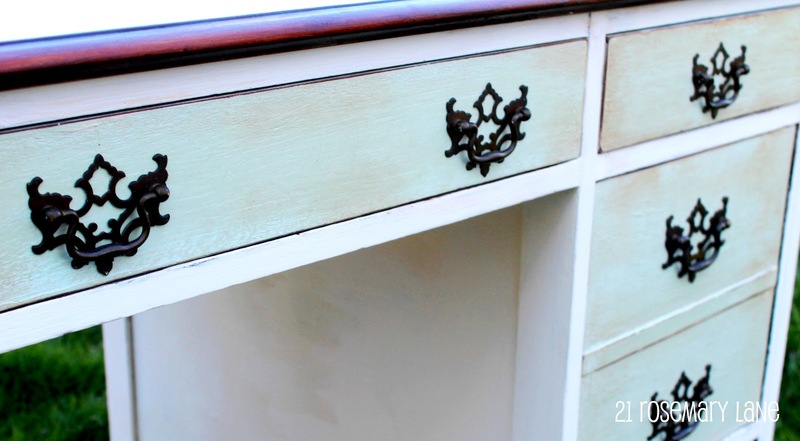 You got a great deal on the desk and making your own chalk paint is super thrifty! Love the result! The desk was ugly and now it's gorgeous!!! That desk turned out amazing - great job! Hi Barbara, I have been taking a little blogging break so I am just seeing your project. The desk turned out beautiful and I am so glad you like the paint formula. Thank you so much for the link and the mention. 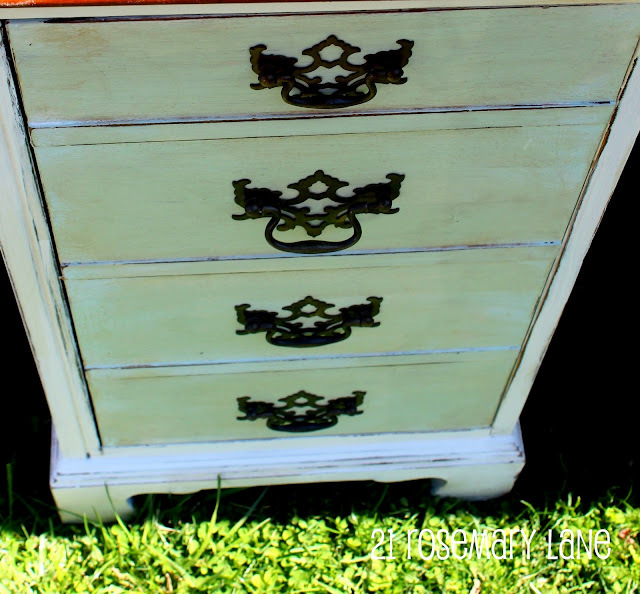 Wow what a beautiful furniture makeover! 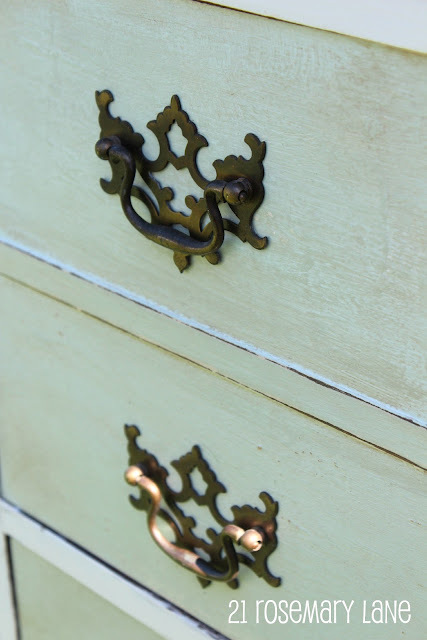 I am going to try your recipe, it is a dream of mine to be able to rescue and re-purpose old furniture. I found your link from knick of time Tuesday.